Blog — Physio Performance - Physical Therapy. Training. Sports Science. 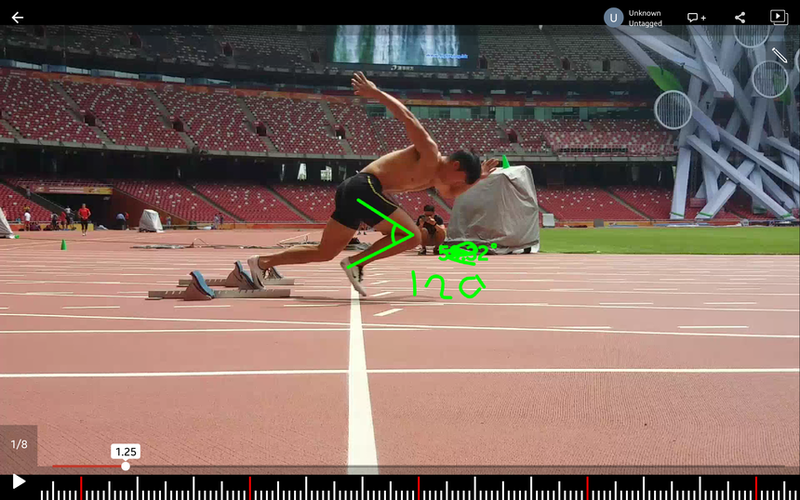 Below is part of an analysis of Su Bingtian--100m sprinter for China and fastest Asian-born athlete ever in the 100m. (note--Su gave me permission to share this). I'll highlight some of the anthropometric differences between someone like Su and Usain Bolt. Taking these factors into consideration of the athlete you are working with/training is critical to identify how to optimize their kinematics between 0 and 100m. 1) When compared to other world-class sprinters, Bolt is able to achieve the optimal ratio of stride length vs. stride frequency. Remember that when constrained by 100m, if one of those variables increases, the other must decrease. Now, the idea of stride length vs. stride frequency is likely well known to many track and field coaches who've been doing this much longer than I have! Many people like to attribute Bolt's greatness to genetics (likely true--it's no secret that a longer stride can be favorable), however, to my knowledge this was the first time that someone examined why Bolt's running is unprecedented from a kinematic standpoint. In being able to optimize this ratio of stride length:stride frequency, he was able to get up to a blazing >27mph (12.3 m/s) during some 10m sections of the races. On average, he took approx 41 steps in 100m, while his competitors took an average of 43-48 steps. Again, no surprise that he takes fewer steps if his stride is longer, but their point was he found the optimal ratio based on his frame. 2) Bolt is able to maximize his time on the ground by most likely applying more force directly into the ground than the other runners. This is potentially why he often has slower starts. During that time, each leg is in contact with the ground for a bit longer, however while doing so he is creating a tremendous amount of power. I wish I could put a force plate underneath him to measure the amount of force he generates! 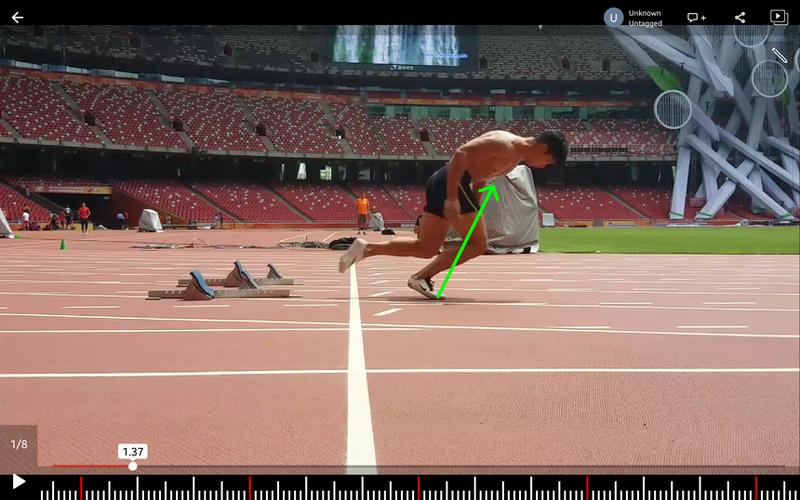 Below is Su out of the blocks on the same track that he ran on against Bolt in the Youtube link above. As I mentioned, Su is excellent during the first ~70 m of the race (especially the 0-40m mark). In that distance, Su is likely at an advantage partly because of his size. Because of his shorter legs, he is able to take more steps and generate power more quickly than most. From other assessments, I found he has excellent triplanar stability. Because he is so structurally balanced--meaning he is very strong in the frontal and transverse planes, he is able to keep much of his power/strength directed into sagittal plane motion (down the track). I drew what I'd estimate the ground reaction force vector to be in the last 2 pictures. It's important to note you can't 3-dimensionally appreciate how that vector would be oriented (meaning if he was weak, that arrow might be pointing into the screen toward the green grass or out of the screen towards you). But, because he is very structurally balanced I would point the vector straight down the track. When working with more amateur/younger athletes, I think this is one of the most important things a coach/trainer/therapist can work on. Strengthening in the frontal/transverse planes will give anyone a great platform to 'push' from and accelerate down the track. The 'shooting a cannon out of a canoe' vs a stable platform is never overused in my opinion. Another thing that is important to point out is how 'vertical' that force is being applied. In long distance runners, you would want it to be more horizontally oriented, signifying that they are not wasting energy by 'bouncing'. 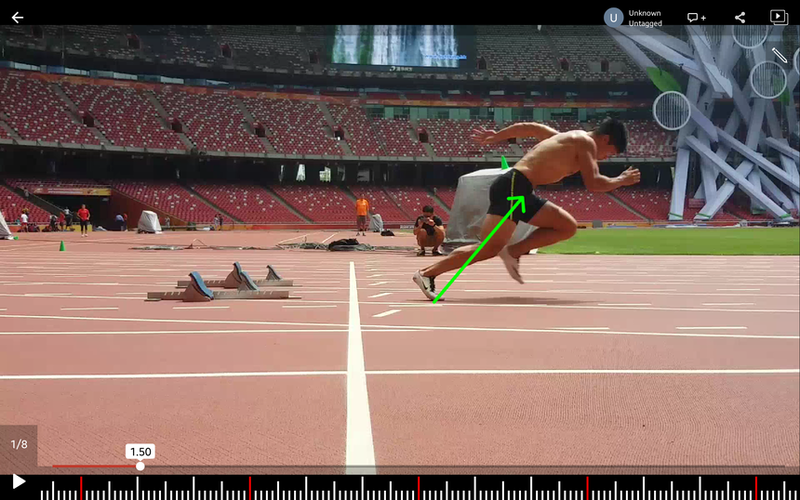 However in sprinters their objective should be to strike the ground with as much force as possible, as quickly as possible. Check out the article I referenced above--it's a great place to start for anyone wanting to learn more. Hope this helps! Thank you for checking out our blog! We will periodically post intriguing thoughts on a wide range of topics including orthopedic and sports physical therapy, performance enhancement, and health. Stay tuned!